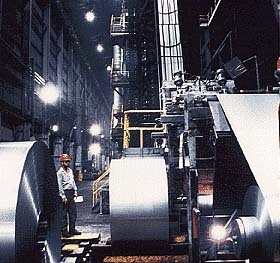 About 38% of flat mill products are coated to improve their corrosion resistance and appearance. Two thirds of coated steel is galvanized (zinc coated), much of the galvanized steel also goes through organic or inorganic coating lines. Galvanized sheet is used in automobile underbodies, air ducts, storage tanks, and other applications requiring corrosion resistance. Painted galvanized sheets are used for industrial roofing and siding, other building products, and appliances. The next most common coating is tin plating which is primarily used for cans and containers. Chrome plating is also used for this purpose. The main energy using equipment is galvanizing and coating lines are integrated continuous annealing furnaces. The equipment, combustion processes, energy use, and R&D trends are discussed in the heat treating section. The most common process is the hot dip process. Coiled steel strip is fed onto a continuous line with additional coils being welded on to the end of the previous line. The strip is electrolytically cleaned and brush scrubbed. The cleaned strip then passes through a continuous annealing furnace and then dipped into an induction heated zinc coating bath. Air or steam jets “wipe” the coating, after which the strip is cooled, chemically treated, stretch flattened (to improve its workability) and recoiled. Electrogalvanizing is an alternative process that eliminates the annealing furnace, zinc pots, and cooling tower with electrolytic cells that electrochemically bond the zinc to the metal surface – thereby creating a product with superior corrosion resistance and appearance. A variety of paint, enamel, lacquer, and resin coatings are applied to steel. A typical line would have a strip cleaning section, an application section where the coating is applied, a drying furnace, and then a cooling and recoiling section. These drying furnaces are typically electrically heated. The strip may pass twice through the application and drying sections to get a primer coat and a finish coat. Tin plating is an electrolytic process. Annealed steel is brought to the electrolytic tinning line. The major sections of a tinplating line are strip cleaning, the tinplating cells themselves, and a post-plating furnace that melts the plating to provide a smooth, even surface. The furnace may use electric resistance, induction, or radiant tube heating. The tin-plate must be oiled before recoiling to permit easy handling and to minimize scratching. Chromium-coated steels (called tin-free steel) is also an electrolytic process following similar steps to other electroplating processes except for the post-heating furnace.